A mysterious villain is playing with time and the consequences are devastating. His goal is to bring about a new world order by returning the Priest, the King of Atlantis and the Ancient Emperor! Claire and her friends must find out who the villain is and stop him and all his minions. But you must hurry! This journey takes you through a world full of extinct creatures and fantastic technologies. It’s up to you to fix time paradoxes in this fast-paced strategy adventure game! Colorful comics and fun characters! 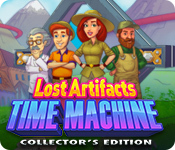 Lost Artifacts: Time Machine Collector's Edition is rated 3.6 out of 5 by 13. Rated 5 out of 5 by chicklets50 from Great game! I really liked this game. It was challenging on some of the levels but not so much that it got frustrating. I enjoyed having to figure it out. I will be watching for the second in the series! Hopefully there will be one. Rated 5 out of 5 by Ndwelt from High Five I've been very generous to give a five to most decent TM games if only to press the point that we LOVE our TM's. Since I only write a review If I feel the game deserves a 1 (bad to the extreme) or a five I held off reviewing this because I thought it very easy. Until a half off sale enabled me to buy it is when I found out that about the 10th episode the game becomes extremely challenging. Still working on level 11 trying to get gold. Very strategic and challenging Love it. Just wish there were collectibles being a collectors edition. Play on friends. Rated 5 out of 5 by Isator from lots of fun even though it is somewhat very much like Gnomes Garden I still like it and have had fun playing it. Maybe a touch to easy but I like the dinos and the different charakters in the game. Great for beginners. Rated 5 out of 5 by rudy1959 from Well Done! What a difference between this version and the past offerings! Gone are the tiny graphics that made the items hard to see, the basic run around and collect stuff and no storyline. The Dev's put some effort and thought into this one. Great graphics that are easy to see and less cartoonish, fun game play and strategy on levels that make you stop and plan before you start. Good job guys!! Highly recommend! Rated 4 out of 5 by Csgentry from Fun Game! I have always enjoyed this series and I have played most of them. However, I think this is a great game but after the first few levels I found it harder to get 3 stars then most of the previous games. If you like TM games you should try this one to see what you think. Rated 4 out of 5 by joybelle_1 from Better than Expected If you only played the demo levels of this game you would be wondering why I was generous enough to give it four stars. But it gets a lot better. 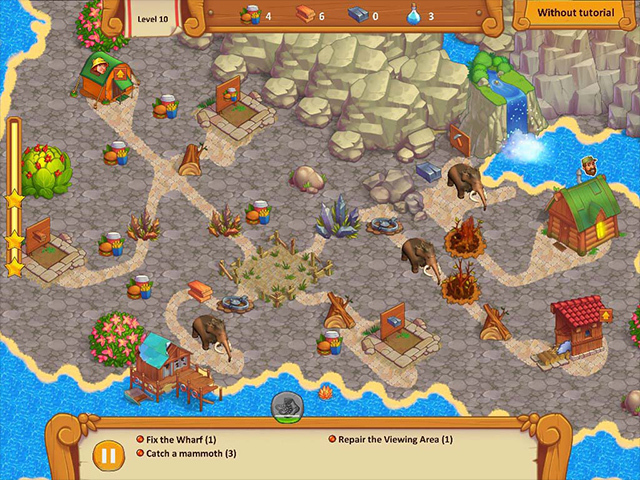 This is really the 'same game' again as other offerings in this series, and a standard gather resources, upgrade buildings, gather food and mana,and fulfill tasks TM. I was not going to ever buy another one of this series, but this time the developers have listened at last. There is a strategy guide included, and achievements to earn, and the graphics are quite improved from the last few games of this series. The characters have improved and are feasible in their task and role. There are scientists who can deal with the 'sands of time' and skeletons in your way, hunters who deal with creatures like wooly mammoths, and Craftsmen who speed up production in your production buildings (merrymakers lol) There are portals, and generators and drones showing quite pleasant graphics.. I am on the fence as far as recommending it as a CE. I can recommend the gameplay, and strategy is definitely needed so perhaps I will need the guide as I have had to shuffle along and change my directions and upgrades already quite early on. But I have so far worked it out on second shot at any level. There is however nothing totally outstanding here. There are no collectables, but there are 50 levels and then bonus levels. I am really enjoying this one, and the gameplay is quite good so I will recommend it. Rated 3 out of 5 by Keeper2614 from They need to work on the goal fly overs This is a decent game but when you hover over one of your tasks the fly over is way too big for the screen which is annoying because you have to wait for it to disappear before seeing items on the screen. They need to figure out a different way to let you know what your resource goals are. Rated 3 out of 5 by MercuryNeptune from A step down The first thing I noticed is this game does not let you choose your own mode such as timed or relaxed. Why did they not allow us a choice in the matter? I play the games in relaxed mode so I can enjoy myself. The graphics also seem a bit more primitive than usual. I can see them fine, but they are not very impressive. 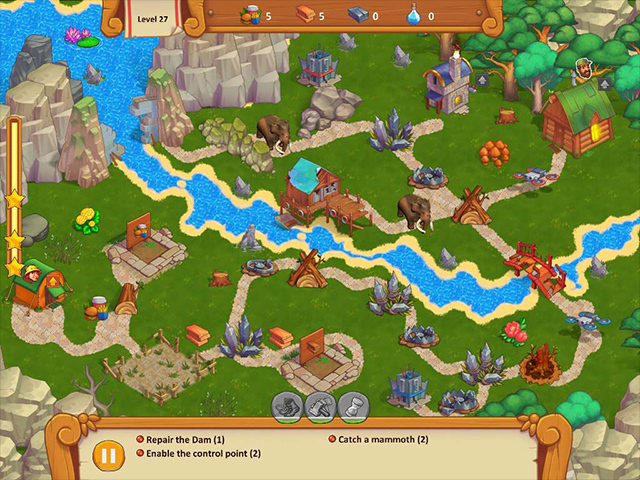 The tasks are the same as the other games as one builds and gathers resources to fulfill a task for a level. 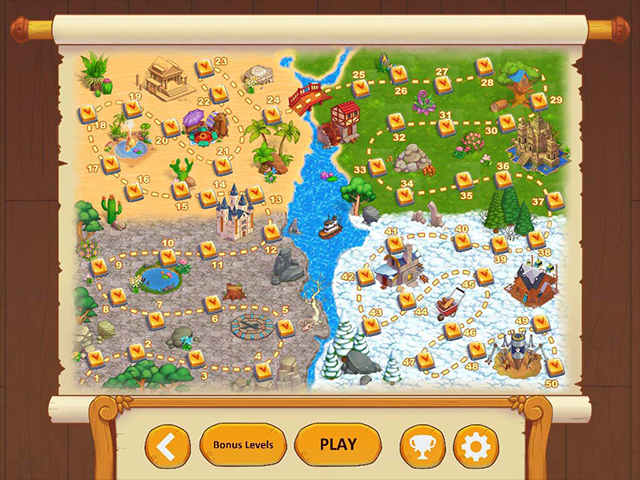 There are 50 levels plus ten bonus levels in the CE. The levels do give enough time early on but things do get a bit challenging. I don't care about not earning stars but I do care if you have to start over. Luckily, this game does let one continue if time runs out. There are no collectibles to find in the CE and it only has the ten bonus chapters to offer. There is also a strategy guide which some might find useful. The ten bonus levels are also included in the CE but I'm not sure it made this worth the price. Still, it is a way to pass the time on a cold winter's night. Lightly recommended for those who collect CEs. Rated 3 out of 5 by bellablue70 from Not so fun TM game TM games are my favorite, but this one was on the bottom of my list. Nothing special , boring . Rated 3 out of 5 by asdkid from Those annoying sounds If it hadn't been for the annoying pinging, poop and tap tap tapping sound I would have bought this game I just can't stand the sounds, I turn off the music on every game but you need the sounds so you know when things are done, Please change the sounds.